We are honoured to have Prof. Ray Yep, Associate Head of the Department of Public Policy at City University of Hong Kong, to be our interviewee this week. 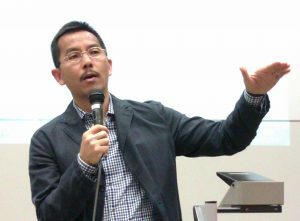 A political scientist by training, Prof. Yep specialises in the study of the political economy of China’s reforms, the late colonial governance of Hong Kong, and contentious politics. His book on the ICAC 靜默革命：香港廉政百年共業, edited volume Negotiating Autonomy in Greater China: Hong Kong and its Sovereign before and after 1997, and the co-edited volume with Robert Bickers, May Days in Hong Kong: Riot and Emergency in 1967, provide us new perspectives in understanding late colonial Hong Kong. Active in rendering community services, Prof. Yep has also served as a member of the Advisory Council for Environment, the Strategy Subcommittee of Sustainable Development Council, and the Central Policy Unit. Currently he is also the Research Director of Synergy Net (a local policy think tank), a member of Policy Advocacy and Research Committee of Hong Kong Council of Social Services. RY: Not sure if I have really started my career as a historian. I am a political scientist by training. My doctoral work is on political economy of rural reforms in contemporary China, and I am still researching on land reforms and local finance in mainland China today. It is Gary Cheung’s book on the 1967 Riots published 13 or 14 years ago sparkled my interest in history. I found his work exciting and was hungry for more. I hoped there would be more scholarly works available but unfortunately there was not much academic attention to this issue. Then, I thought, “ok. Maybe I should try to do something myself”. Next thing I know is I have been buried in the archives at Kew almost every summer since then. HKHP: What needs to be further explored in Hong Kong studies? RY: I am probably not qualified to answer this question. Personally, I am always interested in understanding how the British Empire really worked. Was there a coherent and proactive strategy in London in regulating colonial development? And how did the colony defend and pursue her agenda? I think the relationship is very much a product of ceaseless bargaining and negotiation and the colony’s subordination depicted in the constitutional documents like Letter Patent and Royal Instructions may not uncover the whole picture. HKHP: How do you see Hong Kong’s place in the study of history? RY: I always believe that Beijing’s idea of governing Hong Kong after 1997 is very much based on her perception of colonial autonomy before the Handover. If we study Basic Law carefully, we can find many provisions are almost identical with the arrangements in colonial years. For examples, the Central People’s Government has the right to invalidate Hong Kong laws, to appoint key officials in local administration and to make laws for SAR. All these were parts of the Royal Prerogatives of the Queen under colonial order. So, for Beijing, the high degree of autonomy bestowed upon the Hong Kong Special Administrative Region is simply “Letter Patent/Royal Instructions 2.0”. That is, she would regard herself even more generous than the British as not only did she choose not to impose any new restraint on Hong Kong; but she even granted more freedom that was not allowed in colonial time to the SAR. For example, the right to set up the Court of Final Appeal in the territory, and the policy of not sending officials to serve in HKSAR Government. And probably because of this self-image, she finds the “ungratefulness” of the Hong Kong irritating and incomprehensible. However, this self-perception of being a generous and tolerant overlord is very much based on her misguided understanding of Hong Kong-London relationship. On paper, Hong Kong’s autonomy was rather circumscribed as there was basically no limit on Queen’s power. However, in reality, the colony was not completely impotent in defending her cases and interests. Nuanced understanding of the colonial past is thus imperative to the appreciation of the dynamics of unfolding of the policy of One Country Two Systems. HKHP: What do you think would be the biggest challenge facing Hong Kong studies? How can we solve it? RY: There are two issues. The first one is language. When you write Hong Kong history, you always feel obliged to make it as accessible as possible for the local audience because this is their story. Whereas the majority may be able to read English, you can sense a big drop in interest when the material is not published in Chinese. But we all know about the “perish or publish” culture in academia today and most Chinese journals are not considered as creditable outlets by University management. I don’t see any easy way out. I suppose senior local scholars who are immune to tenure pressure should take the lead in writing in Chinese. The second issue concerns politics. There seems to be a growing number of works on Hong Kong that appear to be more like advocacy materials rather than scholarly pieces. We all have our ideological disposition and preference, but we just have to be more conscientious and professional in reading and writing history. We should be aware of the difference between propaganda and scholarship. HKHP: Could you please share with us your favorite quote/person/book that you came across while doing primary research? RY: “A history that dwells only on divided pasts denies us the just inheritance of what we have always shared, namely a capacity to ‘live together in societies sufficiently harmonious and orderly not to be constantly breaking apart,” wrote David Cannadine. A timely reminder for those who are writing history of Hong Kong. HKHP: What are you working on now? RY: I am working on the governorship of Murray MacLehose at the moment. I focus on three episodes: attempt to settle land lease beyond 1997, Vietnamese Boat People crisis, and political reforms in late 1970s. The three issues represents a variation of London’s response in terms of priority, economic concerns and strategic calculation. I see these as window to the understanding of the dynamics of colony-London interaction and the nature of colonial governance. This entry was posted in City University Hong Kong, HKHP interviews. Bookmark the permalink.